Does your Grange have all of its communication ducks in a row, or are communications structured like a house of cards that can fall at any moment? This is a delicate subject, as most do not find issue with their practices until a situation arises and it is too late and the damage is done. If Granges want to present a unified, professional presence to the public, the best way to begin is to centralize their communications. This means, that all means of communication are from a Grange perspective, and not from an individual member perspective. There are three main areas -- mailing address, phone number and e-mail. It is never the best practice to use a Grange member’s home address, e-mail address and phone number for official Grange communications. What if something was to happen to said member? How would other members receive phone calls, e-mails, and the USPS mail, such as bills and important letters? This very thing happened to another organization that I belong to outside of the Grange. The President of the group died unexpected (after being President of the group for nearly 20 years), and his family had no care or concern whatsoever about his philanthropic interests. So when his family cleaned out his home, they literally threw out everything having to do with the organization, despite the continued pleas of members from the group. It was a nightmare for this group to have to rebuild from the ground-floor up, losing decades worth of historical information, and also not being able to access bank accounts, write checks and pay bills, access safety deposit boxes and more. This is a worst case scenario. Do not let this happen to your Grange. All CT State Grange Officers, Committees, and Community Granges have been assigned a FREE e-mail address and mailbox (ie: yourgrange@ctstategrange.org). Instructions on how to access these accounts were given to all Granges in their Public Relations Packs. Currently, nearly 100% of Officers and Committees are accessing their Grange e-mail, and approximately 1/2 of the Granges in the state are using these e-mail address periodically, if not regularly. 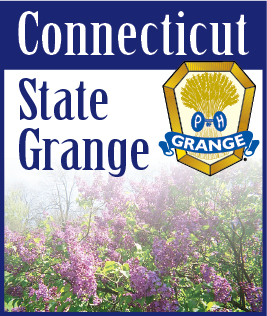 Using a Grange-specific e-mail address supports branding of the Grange in Connecticut while providing a professional “face” to the public, the media, and also to the State Officials and Representatives. When a Grange member sends out a “Grange” e-mail, it will be taken more seriously coming fromyourgrange@CTStateGrange.org than it does from hotlips@yahoo.com (I know the yahoo e-mail is an extreme example, but we actually do have some folks who have similar style e-mail addresses and use it for official Grange business.) If you are not already using your Grange e-mail, please contact information@ctstategrange.org or publicrelations@ctstategrange.org and we will send you access instructions. The more Granges that use their e-mail addresses, the more efficient we can communicate as a group. Plus, every e-mail sent and received saves printing and mailing a letter - thus saving in postage alone. One of the biggest advancements available to Granges is communications technology. Specifically, tools and resources available at low or no cost, to enable Granges to centralize communications, and thus better promote themselves as a unified group, and get their name out onto the tips of everyone’s tongues.